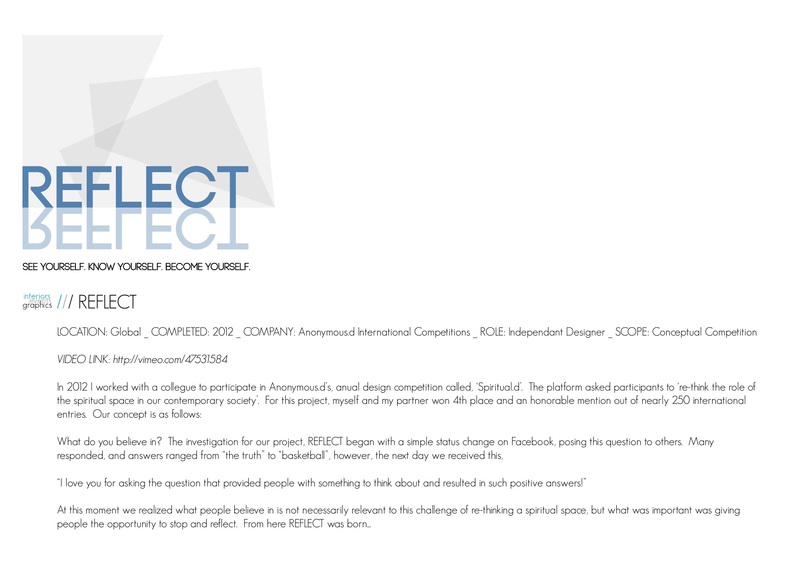 Rebecca Mason - Interior Design - REFLECT - See Yourself. Know Yourself. Become Yourself. 1) Generally, people don’t believe in a specific deity or religion. They find themselves to be spiritual (or would like to be), however, they are unclear of how to work this into their busy lives. 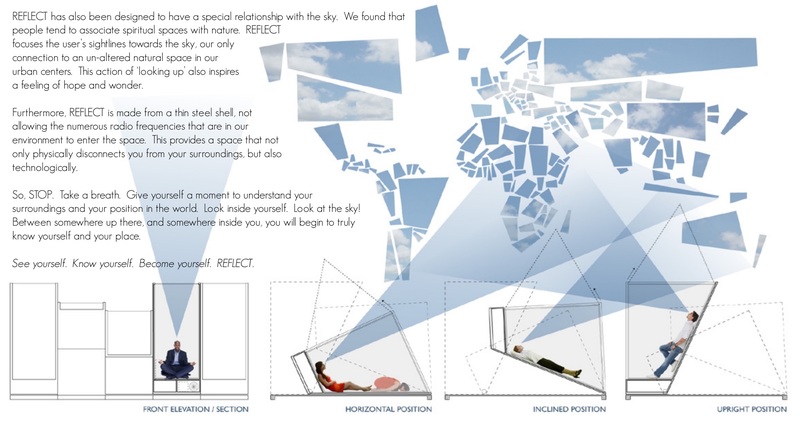 REFLECT is meant to function as a piece of urban furniture. 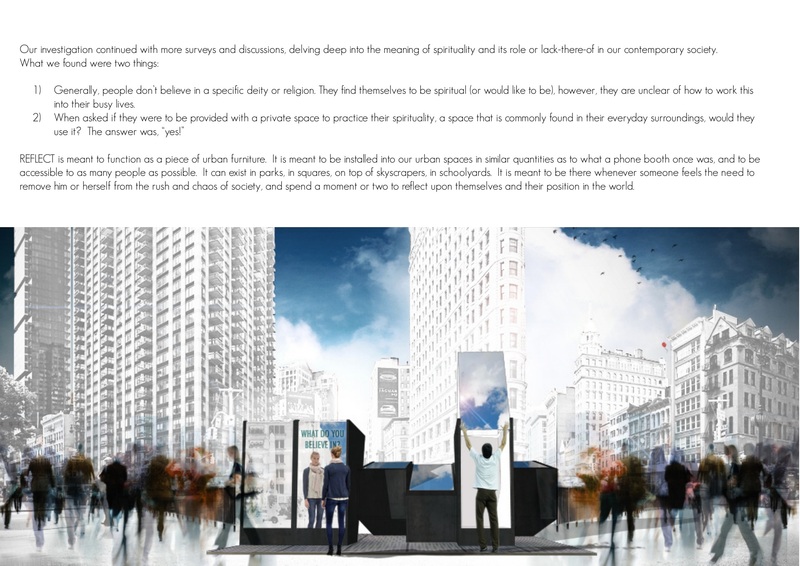 It is meant to be installed into our urban spaces in similar quantities as to what a phone booth once was, and to be accessible to as many people as possible. It can exist in parks, in squares, on top of skyscrapers, in schoolyards. It is meant to be there whenever someone feels the need to remove him or herself from the rush and chaos of society, and spend a moment or two to reflect upon themselves and their position in the world. connection to an un-altered natural space in our urban centers. This action of ‘looking up’ also inspires a feeling of hope and wonder. Furthermore, REFLECT is made from a thin steel shell, not allowing the numerous radio frequencies that are in our environment to enter the space. This provides a space that not only physically disconnects you from your surroundings, but also technologically. So, STOP. Take a breath. Give yourself a moment to understand your surroundings and your position in the world. Look inside yourself. Look at the sky! Between somewhere up there, and somewhere inside you, you will begin to truly know yourself and your place. See yourself. Know yourself. Become yourself. REFLECT.